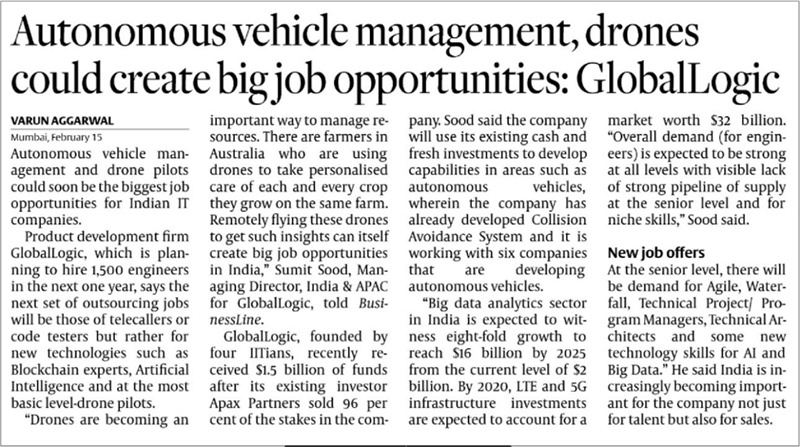 Mumbai, February 15, 2017: Autonomous vehicle management and drone pilots could soon be the biggest job opportunities for Indian IT companies. Product development firm GlobalLogic, which is planning to hire 1,500 engineers in the next one year, says the next set of outsourcing jobs will be those of telecallers or code testers but rather for new technologies such as Blockchain experts, Artificial Intelligence and at the most basic level-drone pilots. “Drones are becoming an important way to manage resources. There are farmers in Australia who are using drones to take personalised care of each and every crop they grow on the same farm. Remotely flying these drones to get such insights can itself create big job opportunities in India,” Sumit Sood, Managing Director, India & APAC for GlobalLogic, told BusinessLine. GlobalLogic, founded by four IITians, recently received $1.5 billion of funds after its existing investor Apax Partners sold 96 per cent of the stakes in the company. Sood said the company will use its existing cash and fresh investments to develop capabilities in areas such as autonomous vehicles, wherein the company has already developed Collision Avoidance System and it is working with six companies that are developing autonomous vehicles. “Big data analytics sector in India is expected to witness eight-fold growth to reach $16 billion by 2025 from the current level of $2 billion. By 2020, LTE and 5G infrastructure investments are expected to account for a market worth $32 billion. “Overall demand (for engineers) is expected to be strong at all levels with visible lack of strong pipeline of supply at the senior level and for niche skills,” Sood said. At the senior level, there will be demand for Agile, Waterfall, Technical Project/ Program Managers, Technical Architects and some new technology skills for AI and Big Data.” He said India is increasingly becoming important for the company not just for talent but also for sales.